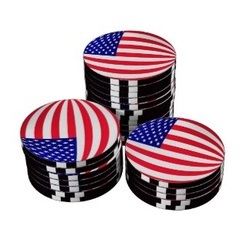 ﻿﻿Until recently there were no real-money mobile poker options open to United States players. A number of U.S. poker rooms have released mobile clients that support high-speed poker, Sit and Go tournaments and Texas Hold'em and Omaha ring games on Android. 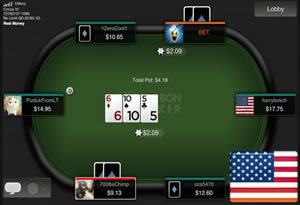 Poker players in the US can finally play real-money poker on iOS and Android phones/tablets. More and more Android compatible poker sites are now offering players the chance to compete in tournaments or play ring games. All of these mobile poker apps are available throughout the USA, including Texas, California, New York, Boston and Chicago. Using your mobile device to play real-money internet poker has just got easier. You can now play Texas Hold'em and Omaha cash games in any country without having to install an application. These instant-play web clients offer all the same great features without the hassles. Sit N Go and Multi-table tournaments are now also available on mobile devices, as well fast-fold poker games. You can even play with complete anonymity in the U.S. thanks to the growing number of Bitcoin poker sites. We only recommend real money mobile poker rooms that are totally legit and can be played legally by US citizens. Bovada Mobile Poker is now available in the United States and other Latin American countries, including Brazil, Mexico and Argentina. Bovada now also allows you to bank with bitcoin (as well as Visa, Amex & Mastercard). Play speed poker and a variety of Omaha and Texas Hold'em cash games on your phone. BetOnline have developed the best poker apps for players in the United States. They accept real money players from all 50 states and their mobile poker client can be played from your phones browser or installed. The app offers everything from private tables to cash games, MTT's and Sit & Go's. Because of their acquisition of Bovada Poker, Ignition has quickly became one of the biggest online poker rooms for real money players in the United States. At Ignition you will find Zone speed poker and Hold'em/Omaha cash tables. Ignition is compatible with iPhone, Android and Windows Phone. ﻿﻿﻿Bitcoin poker rooms are becoming increasingly popular in the United States because they allow you to easily and anonymously bet online. Nitrogen Sports is the largest gambling site and their new mobile poker apps offers cash games (Hold'em & Omaha) and tournaments (MTT's, Sit & Go and Free Roll). WE DO NOT RECOMMEND CARBON AT THE MOMENT DUE TO THE EXCESSIVE WAITING TIMES TO PROCESS PLAYER WITHDRAWALS. Carbon Poker is the best poker app for anyone hoping to play real-money games in the United States. Carbon Poker offers both Texas Hold'em No Limit and Fixed Limit games. Compete in Sit & Go tournaments at a variety of speeds and levels. There is no download required so you can start playing cash games instantly. In the world of USA friendly online poker rooms, the 3 big names are Bovada, BetOnline and Americas Cardroom. 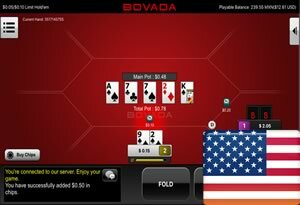 While both Bovada and BetOnline have been offering mobile poker for a couple of years, Americas Cardroom have only recently added Texas Hold'em iOS and Android games. 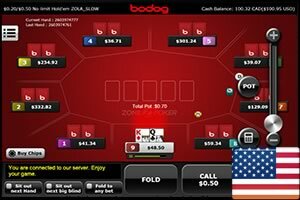 Despite Bovada being one of the biggest online poker rooms in the United States, their iOS and Android poker only offered Holdem and Omaha cash games until recently. Thankfully, they've now added MTT's and Sit N Go tournaments to the U.S. friendly Bovada poker app. Mobile poker sites are evolving as fast as the hardware they run on. 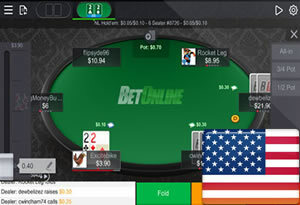 The latest generation of United States friendly Android poker sites offer a wide range of amazing features, including Sit & Go tournaments, players chat, quick seating, hand histories, multi-tabling and high-speed games. Their popularity has meant that online poker rooms that accept U.S. players have been working around the clock to develop the most advanced real money iPhone and Android sites possible. Here are a few question you should ask yourself if you are planning to play poker on your phone or tablet in the USA. Is this online poker room a legitimate brand with a good reputation for honesty and security? The safety and security of your personal and financial data is of the utmost importance. It is always better to choose a recognizable poker brand with a long standing reputation for fairness. We only recommend well known U.S. facing poker networks, who have at least a decades worth of experience and an unblemished record. Carbon Poker Mobile is part of the popular Merge Gaming Network that is currently the third largest U.S. friendly poker network. They have met the strict regulations set by the Kahnawake Gaming Commission in Canada so you know your dollars are safe. Do these mobile poker sites for Android phones/tablets welcome United States players? While we all know that there is no shortage of play for fun poker apps for US gamers in the Google Play app market, finding a real money poker option can be more difficult. A small number of states like New Jersey and Nevada have legalized online poker and have granted licenses to a handful of poker rooms. Even if you don't live in one of these states, there are still legitimate online and mobile poker sites where you can legally play real-money poker on your mobile device. Do any of the US Android poker rooms offer tournaments? Despite huge advances in mobile gaming technology, many internet poker sites still only offer their players ring game options. If you are a tournament nut who is only interested in playing Multi-table and Sit & Go tournaments, it is always better to check first before you download the application. Since Carbon Poker are part of the increasingly popular Merge Gaming Network, their tournaments schedule is very busy and you won't have to wait long for tables to fill up at any time of the day or night. How can I make a deposit at these U.S. Android poker sites? Banking options are always a concern when choosing a new internet poker site. All of the Android compatible poker sites that we work with are 100% legal in the US so you won't experience any problems funding your player account using Visa, Mastercard or Skrill. Bank wires, checks and Bitcoin payments are also an option. Even though the authorities take a pretty dim view of it, many people are surprised to hear that gambling online is actually legal in most US states. UIGEA (Unlawful Internet Gambling Enforcement Act of 2006) and Black Friday were both crackdowns aimed at U.S. banking institutions and not at individuals. Here are 3 key facts concerning the legality of Android poker in the US. There are no federal laws in existence that ban either online or mobile poker. No action has every been taken against an individual poker player on either a federal or state level. All legal cases have been brought against the poker providers or the payment processors. Internet poker is still legal in the USA because it was deemed to be a game of skill by a judge in a federal court of law. Mobile poker apps have always been a contentious issue when it comes to their promotion in both the iTunes App Store or Google Play. In the early years gambling apps were forbidden until Apple introduced geo-location tracking to iOS, which allowed them to restrict real-money gamblers to certain U.S. states. Google initially permitted any type of sports betting, poker or casino app into the Android Market, until they eventually had a change of heart and updated their Google Play content policy to include a clause that stated "We don’t allow content or services that facilitate online gambling". Despite this, poker rooms are starting to fight back with a cunning way to avoid the iOS, Android, BlackBerry and Windows Phone app stores altogether. The technology comes in the form of HTML5 which allows web developers to create apps that are completely web based. This means there is no need to download or go via a ‘store’ to get your app, simply type in the web address in the Chrome or Safari browser on your smartphone and it realizes you are on a mobile device. Leading the way in this technology is Carbon Poker who have made one of the first US instant play Android poker sites. The app runs, looks and functions just the same as any ‘normal’ app and it operates perfectly even if you live in New York, Boston, Chicago or Los Angeles. Web based Android poker sites do offer the following 5 major advantages. The biggest advantage is that these poker apps are United States friendly and can be played from anywhere in the world. Only one app needs to be developed for all devices which means that more resources can be poured into that singular app rather than on an amalgamation of different platforms. The software never needs to be updated since you are always running the latest version from the web server rather than from your phone. This also makes these browser based iPhone and Android poker apps extremely secure. Since web apps are platform independent, they not only run on iOS or Android smartphones like the Samsung Galaxy, Google Nexus or Motorola Moto X but you can also play against your friends who use a BlackBerry Z10 or Nokia Lumia. Web based poker apps use less processing and battery power on your Android phone, which means you can play for longer.